Bold claim for the title, but really my blog post can probably be summarized with one sentence: it’s different for everyone. We were told repeatedly that routine and lists and organization need to become priorities in our life to minimize the work Jason’s brain is doing just to get through each day. And so we’ve spent the last two years trying to refine and adapt our routines and coping mechanisms to make life easy. We aren’t the best at it, and despite the fact that I actually love routine I’ve learned it’s really hard to enforce when you also want to feel like you have a full life. Life routine. In general, I do not set us up for success in general routine. My work as a massage therapist and as a Norwex sales rep does not have the same schedule week to week and so my ability to help out around the house changes. I have, at various times, considered trying to find an office job or retail with set hours, just to make our life a bit more predictable but frankly my job and coworkers are often one of the things that keep me sane and happy. Lists. Lists are great. I am a super list maker. I can have lists on the fridge and in my dayplanner and my phone and the car. I make a ton of lists. But do they make sense to Jason? Is my writing even legible? Is he even checking them? Lists are only a great tool if you use them after making them, which is sometimes a challenge. One of our goals for 2017 is to work on using lists more efficiently. Meals. Despite always being a meal planner, meals are an area we have struggled quite a bit since the brain injury. The exhaustion and frustration that controlled much of our life early in this journey meant that by dinner time we had no ability to cook. Even as we started to get more disciplined with sleep and routine, my grocery list making or shopping often left us scrambling when we didn’t have the right ingredients. We’ve since found a pretty good solution that I’ll discuss in another post. Relationship. Brain injury stole a lot of our newlywed memories and experiences. We’ve had to rework how we live out our marriage so that it a)helps us both feel loved and b) doesn’t take all of Jason’s energy. Over the next month or so I’m going to go into each of these topics in a bit more depth to explain what systems we use that seem to help us live out routine. Nothing is new or amazing, I basically just explore pinterest for hours to see what other people do, then try it at home and adapt it 8467 times as needed. My hope is that with this mini series of posts we will be able to help anyone see that a) Brain injuries may require life long problem solving and energy conservation, b) provide examples of systems that may work for others or may spark ideas for others. Every brain injury is different, every family is different so what works for us today, may not work for us in a few months let alone for a family with different challenges. As I start to get back into writing I have a whole folder on my computer of articles I want to share and discuss and studies that are being published. Today though I want to start with discussing an app we found just before Christmas that has been a huge help. We’ve discussed previously how post TBI initiation and memory can prove challenging and for a long time I felt like Jason’s mother constantly advising him on what he needed to do each day and when. It does not make for a good relationship when one is always in control and neither of us loved the arrangement. 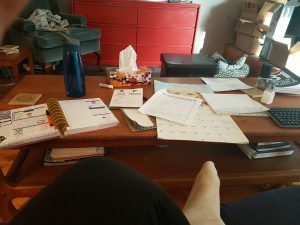 We have various lists and routines around the house that took some of the burden off of me, but weird one off tasks or phone calls were still falling through the cracks regularly. We needed something we could both access, when we were at home AND away from home and that we would both use. It’s a pretty tall order. OurHome is an app that is free to download on itunes and Google Play and allows members of a household to share to do lists and grocery lists. I know there are tons of apps out there that sound similar but this one has the unique feature of awarding points (determined by you) for tasks and then those points can be redeemed for points (again, determined by you). We both needed to be able to access it, at home and away from home. This one is pretty obvious – download the app to each of your phones. Take your phone with you when you leave the house. OurHome allows you to set up a family account and you can each add tasks to each others lists, put in due dates and assign points. The app seems to automatically assign points in relation to the time it should take to complete the task but this can be changed to make important tasks more valuable. Being able to access the app anytime and anywhere has meant fewer tasks get forgotten. We’ve all had that moment where you are at the gym and suddenly remember you need to take meat out for dinner right? Now I can actually write that down quickly and it actually happens when I get home. We needed to use the app. Here’s the issue with pretty much any coping strategy that is suggested to those with TBI’s. They only work as well as you make them. Lists, phone alarms, pneumonic devices – they may all help but you need to do the work to use them. When Jason is already tired and struggling with cognitive skills he often won’t remember that he needs to check the list or he’ll swipe away his phone alarm without changing tasks. The possibility for these limitations is still there with OurHome but the incentive of having points and rewards really minimizes how often things are forgotten. As a family you set up your own rewards, for us things like getting a new tea or a no alarm day are extremely valuable and so take more points to achieve. We wanted to feel like a couple of adults again. It’s very hard to feel like one partner is the parent and one is a child in day to day life. When I presented this app to some other TBI families they brought up the fact that it would seem condescending to bribe your husband to do chores. I have to say, that is not the dynamic in our relationship and it probably has everything to do with how you approach the app as a family. Jason and I both use the app, we both have the ability to add and remove tasks and determine our own rewards. Rather than feeling like a manipulative tool it feels like a good way to keep our life on track and get some well deserved me-time/tea/treats/fun activities. This post isn’t going to take the typical treatment format because a wide variety of courses and degrees qualify others to legally provide talk therapy in Ontario. In our first year alone we dealt with psychologists, counselors, and social workers. If you are trying to have your talk therapy covered by extended health benefits it is important to find out what qualifications they will cover treatments with, ours only covers time with psychologists. I have long been a supporter of talk therapy, I think we all need it at some point to help with different stages of life. That being said, some of the experiences we had this year made me HATE talk therapy. It had nothing to do with what was being discussed and everything to do with the people we were working with. So my number one suggestion would be – please take some time to interview your therapist before you commit to a treatment plan. Our first round of treatments was separate sessions with psychologists just one month into our life with TBI. Because the team we worked with had very little experience with traumatic brain injuries they were not able to understand where we were coming from and ended up spending time on the wrong things. Jason, the victim of an assault that changed our life, was discharged within 3 sessions because they were certain nothing was wrong and he hadn’t been affected by the experience. The psychologist I was dealing with felt I was too invested in Jason and must be co-dependent. The issue here is that Jason’s injuries left him with a lack of self awareness that anyone that has experience with TBI should have noticed and approached the treatments differently. If my psychologist was aware of how much care is needed in the early days of TBI they should have set me up with plans for stress relief, ways to approach conversations with Jason etc. instead of seemingly shaming me for being a caregiver. Those first experiences set us back and delayed our ability to reach out for help again for months. When Jason entered rehab we were delighted to be offered couples sessions with a social worker. Unfortunately the first social worker we met with was filling in and not well versed in TBI. She dismissed us 30 minutes into a session with the advice that I should get over being upset because symptoms are symptoms and this is our life now. The next session we lasted about 10 minutes because when she asked Jason to list a “stressful event” from the week he wasn’t able to….because you know, he has memory deficits post TBI! Our third social worker was a gem. She was kind and honest and while she said we did need to learn to work with the symptoms of TBI she offered solutions. She talked through different possible outcomes from decisions we were struggling with. She advised us to have fun again. She was encouraging. Jason and I were both sad to say goodbye to her at the end of rehab and touched when she set us up with tons of groups and contacts in the community to reach out to when we felt we needed help. I don’t relay our experiences to shame anyone. My point is, this isn’t necessarily a case of more education creating clinicians. In our experience it came down to their experiences with traumatic brain injury and their time in their career (burnout is a very real issue that may have affected a couple of people we met). Do some research and have some conversations with the people you are thinking of hiring. Ask Brain Injury groups around you if they have anyone they recommend. Talk to other TBI survivors and see if they have anyone they’ve worked well with. I’m including a link to this article by LifeHacker to discuss some of the steps you should take to find someone to work with. Finally, I generally like to suggest sticking with one treatment plan until the end to see what a clinician can do for you. But I know how expensive treatments can be and I saw how negatively we were effected by our time with psychologists. So my new suggestion would be if something is striking you as wrong or dismissive of TBI it may be okay to end the sessions and search for a new clinician to work with. We’ve long established that we received terrible doctor’s care early in Jason’s journey with TBI. We did our best to ask for some referrals from our doctor but because Jason’s symptoms were so “mild” we never thought of asking for a speech and language pathologist assessment and even then it was for some swallowing issues and not at all related to the cognitive symptoms we noticed. We were blessed with two SLP’s who were each kind and wise and opened our eyes to their importance. Even if you haven’t noticed specific speech issues please take a moment to read about our experiences and consider your situation. Price: in a hospital setting covered by OHIP, private often $100-150.00 an hour. There are some funding options available here. “Often taken for granted, the ability to communicate effectively is essential to achieve and maintain quality of life. Speech, language and associated cognitive disorders can adversely affect academic performance, workforce integration, and social interaction. Treatments that speech-language pathologists are uniquely qualified to provide can help individuals with expressive and receptive language, articulation, fluency, voice, resonance and cognitive communication disorders (e.g., memory, organization, problem solving) reach their full communicative potential. Also of concern, individuals with untreated swallowing disorders can find themselves at risk of dehydration, malnutrition, and pulmonary compromise. Speech-language pathologists are trained to provide therapies that lead to improved swallowing safety, function, and independence. Their website also has a section specifically about SLP and acquired brain injury – please take some time to read it and understand their massively underestimated skill set! The first SLP Jason had the chance to meet was focused on swallowing issues he was having. He would often have trouble swallowing dense foods and occasionally vomited in his sleep which finally convinced his doctor to refer out. This first SLP was flabbergasted that Jason had not been referred earlier in his recovery as most TBI cases with as much damage as he had are offered 2 sessions a week with a speech language pathologist for at least the first 6 months of recovery. She completed a long and thorough assessment to determine if further testing was needed. Given it was only a few foods that seemed to cause problems she elected to spend the rest of her session counselling Jason on appropriate self care post TBI. Shortly after Jason was accepted to Toronto Rehab and had the chance to work with an SLP once a week. We were delighted to learn that even though we hadn’t noticed any issues with pronouncing words there was still work to be done. Jason spent most of his sessions working on strategies for word recall (an issue he often struggled with but no one cared about until then). He was given work sheets to complete at home for grammar and focusing on words. He and his SLP and a student practiced carrying on “meetings” and worked on strategies to help him make notes while also participating in the meeting. Have you ever thought about how glorious our brains are that they can take in information, create our own opinion, voice that opinion and still remember what was said before we spoke? It’s amazing and takes work and practice and this SLP allowed him time to work on these skills without the pressure of being fired at work. Jason was tasked with creating a power point presentation similar to something he would create at work and then presented to his team. His SLP provided feedback on the experience, word choice, how to find his place in a presentation if he got off track. I’m still in awe of these professionals that have so many skills and solutions to help their clients reestablish their communication skills. I’m grateful for the time Jason spent with them and the many bits of knowledge they shared with us. In the private setting Tracy Milner assessed Jason using the BrainFX 360 tool which was the first real assessment Jason had in his recovery. She spent time explaining her results to us and our families and started working with Jason on sleep hygiene, a lot of the ideas we discussed last month came from her advice and materials she suggested. She worked with both of us on how to set up our home and schedule to make communication easier and later this year I’ll be writing about some of the designs we’ve used to create a command center in our house. She put together a modified work program for Jason’s employer and met with them to explain what Jason’s limitations were and how they were affecting his work as well as she offered solutions that were workable for his management team. This alone was worth millions because recruiting Jason’s manager to be on our team and fighting for Jaosn was so important and there is a glaring lack of information out there for employers of those with traumatic brain injuries. Tracy had plans to start working on cognitive skills such as planning Jason’s work days and project management but at that time he was admitted to Toronto Rehab and it was a program we couldn’t refuse. In the hospital setting I think Jason was at an advantage because he already had an understanding of his limitations and lifestyle changes thanks to his time with Tracy. His OT at the rehab program was able to jump right in to tasks tailored to his goal of returning to work full time. Where we were only able to afford to meet with Tracy every 1-2 weeks rehab was offering OT sessions two times a week. The activities included things like: a treasure hunt of sending emails, making phone calls, checking in at locations around the hospital that let me work on goal setting and prioritization, building a motor and discussing energy conservation.